I don’t come from a big gaming family. I didn’t pick up boardgaming from my dad. I don’t learn new games from my mom or my sisters. In fact, besides Settlers of Catan, my family has not tried any of the strategy games I have (with the exception of 1 sister, who has even sat through a game of Android with me). They tend to assume that my games are a complicated mess that will take hours and hours to play. Well, some of my games (I’m looking at you, Android) are a complicated mess that take hours and hours to play, but most of the games in my collection have about an hour playtime and are relatively simple. There is some variation in there – Munchkin is pretty straightforward, the mechanics of Smallworld are simple but beefed up with all the special race abilities, and Cosmic Encounter is short but can get crazy fast with red-level alien powers. Still, I think my family could actually handle a lot of the games I play, and even enjoy them. The trick is, I have to work my way up. Starting with Cosmic Encounter would probably not be a great choice. It’s a fun game with a sci-fi theme (most of my family is pretty into sci-fi) but with all the possible alien powers that strike up the complexity, they could easily become confused and turned off, striking a blow not only against the game but against the idea of playing “uncle wolfie’s” board games as well. A twist to the problem is that I don’t get a lot of opportunities to introduce games. I see my family every week, but we have big meals and spend a lot of time talking over a range of topics and watching my neice and nephew be cute and dance like awesome dancers to kids music. But the longest yard is the first one – getting my family to try that first new game and hope it comes off well. 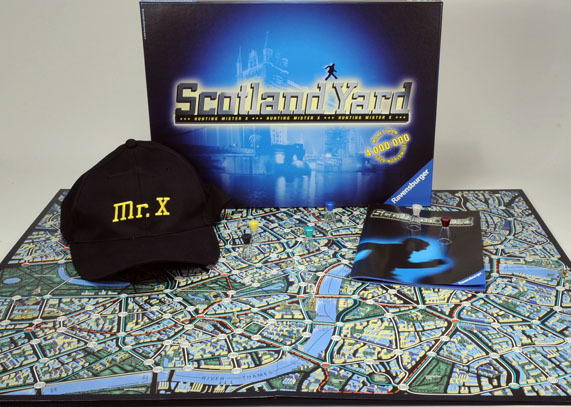 The game I chose was Scotland Yard, for several reasons. First of all, it’s a very simple game. Each player can only do one thing per turn, and it always involves moving. And there are only 3 ways to move. So, essentially, not a lot of mechanics to remember. Secondly, players get to work as a team. My wife likes these cooperative games more, and I figured better to start with a game that wont have the players antagonizing each other. Thirdly, it is strategic, but the strategies and intricacies can easily be discussed out loud without ruining the process of the game. Everyone can be part of the discussion and everyone can feel like they contributed even if they weren’t the one to catch Mr. X. Even my 4-year-old nephew played, spending tickets with the help and advice of his parents and grandparents. Lastly, there are no dice rolls, which if you know my parents feelings about Catan (they hate it because of the collection of resources hinging on, you guessed it, dice rolls), is a good place to start. All in all, I think it was a successful experience. The game went well. I played as Mr. X and in an early mistake, lost the game. But my family seemed to have fun. And now I have some solid proof that at least some of the games I own are accessible and fun. They will trust me more, perhaps, as I suggest other games to play. I have no experience with bringing in new people who are strangers to the eurogaming world, though. My current plan is to bring in more games – continuing with less intense or complex games, such as Kill Dr. Lucky, continuing upward with something like Pandemic (which is, unfortuantely, only 4 player, which is a dampener) and spread to the basics like Carcassonne. I have high hopes for Citadels and Tobago as well, but I plan to take this one step at a time. Have any of you tried to bring non-gamers into the boardgaming hobby? Any advice on the strategy of bringing people in but not overwhelming them? Any good recommendations for simpler, family-friendly games? Previous ArticleThis is a land of Armies… and Land! My family loved Bohnanza and Acquire. Dominion was also a hit, as was Ticket to Ride. I’ve found the best way to introduce a game is to be overenthusiastic about it and build up a reputation of having fun games. Even games that don’t sound fun (bean farming?) are given a chance when you have a good track record. You played Android with a non-gamer?!?!?!?! Your sister must really love… now possibly hate you ;). This is a nice piece you should think about posting this or putting a redirect on your BGG post to this blog. redirect? not sure how to do that. Dude! If you shall recall, the 4 player cap on Pandemic is arbitrary as there are 5 role cards. We played with 5 people twice (to no avail, still lost to that durn virus! ), but still, the 4 player cap in Pandemic can easily be five. dear dm_cadrach, I am almost 100% certain that it is impossible to win Pandemic with 5 players. Which is why the box says 2-4 players. Fewer players makes the game easier… more players spreads cards thin with more diseases added before you get a chance to play them.